The venue is a small fringe space, in a room above The Bread and Roses Pub that seats around 50 people. A few of the actors are already in the space as the audience filters into the room; there is a body sprawled across the main raised platform, and two others sit on the six chairs in front of the platform, which are placed in two rows facing inwards. As the performance begins, the remaining four performers enter the space, taking a moment to glance at the unmoving body before taking their seat. 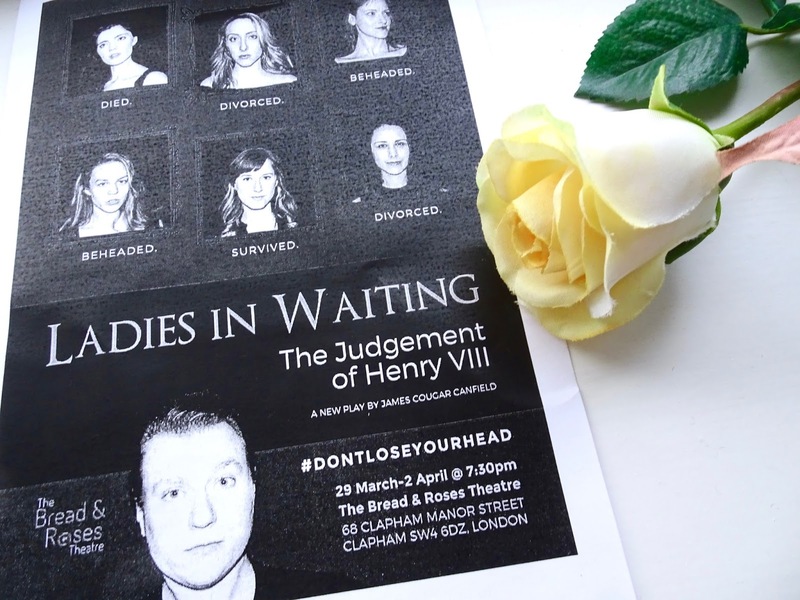 King Henry VIII is dead, and all six wives are ready and waiting in purgatory. The women begin to speak, with a Greek Chorus effect, and it becomes apparent that Henry can’t see his wives, neither is he aware that these voices belong to the six women he married. One by one over the course of the play, each of Henry’s wives is thrown into this limbo space in which Henry has arrived post-death, where he is supposed to reconcile with each of them in order to presumably earn his peace, in whatever form you imagine that to be. This contrast between the space in which Henry is held and the place where the six women sit works really well throughout, with slick lighting changes, sound effects and music aiding the transitions between these physical and metaphorical spaces. It isn’t clear initially why the wives are sent to Henry in the order they are, but it begins to make more and more sense both logically and dramatically. The characters are generally well written, providing a strong mixture of personalities and a good balance of conflicts, resolves and climaxes. There are some brilliantly composed lines and exchanges throughout the script, particularly with Anne Boleyn, however there are perhaps a few too many moments when the characters seem to go back on themselves, or spend a while vaguely expressing sentiments of things that happened in the past, and focus drops slightly. The script certainly excels in moments of specificity, with an abundance of intelligent and often witty remarks and plot devices. Anne Boleyn is arguably the most interesting character and Wendy Kenney plays up to her dramatic ways, as well as drawing out the more subtly manipulative moments. In fact, all six women are portrayed with complete credibility: Kaitlin Gould offers a playful yet somewhat wounded Anne of Cleves; Catherine Howard is a mischievous but heartbreakingly naïve young girl through Margaret Gorrell’s performance; Jessica McClellan is an undeniably lovable Jane Seymour, with a pure and honest soul; Kimberly Hoffman’s unfaltering composure really brings Katherine Parr to life and Hilary Kelman gives a fierce and unbreakable Catherine of Aragon. It is the playwright James Cougar Canfield who plays the role of Henry himself, and though he effectively conveys a lot of the King’s arrogance and self-importance, he isn’t as strong a character as you would expect. As this is at the moment of his death, he is presumably the age of 55, yet much of his dialogue and reactions are incongruously immature, and I was left a little confused about his sense of identity. Both the script and blocking come together to bring a powerful exit for the six women, but again, Henry’s final lines do feel a little weak in comparison. I was left wondering about the message of the play. Is it to do with reconciliation? Does it aim to highlight the power and influence of these six women in the oppression of their patriarchal society? Or is it more simply an alternative look at some of British history’s most prominent figures? The focus is slightly unclear, but the play is certainly an extremely interesting and clever presentation of such an important and ever-studied figure of the past. Ladies in Waiting will next be performed in August at theSpaceUK, as part of the Edinburgh Fringe Festival. *I was gifted my ticket in exchange for a review, but all opinions are my own.